If you’re like most businesses trying to sell your products on Amazon, you wish your sales were higher. You’re frustrated. You’re confused about how to get your products to rank better in search results. Amazon was supposed to be easier than this. I get it. I used to be exactly where you are. It can be downright maddening to watch others make boatloads of sales, while your products stay buried in Amazon search results. And if you don’t think you could be making more money on Amazon, you’re mistaken. Period. Without a doubt. And I can prove it. But more on that in just a minute. I know why your products aren’t selling better on Amazon. Does that sound hard to believe? Not once you know my story. The problem is there is a truly damaging cost to not improving your sales. Every month, most businesses are piling up thousands of dollars you could have made on Amazon and lighting a match to the whole pile instead. I hope someone at least brought marshmallows to roast. But seriously. You couldn’t be doing any more damage to your business if you ran a stack of $100 dollar bills through the shredder each month. It’s not your fault that you’ve been throwing away stacks of cash. Until now, you’ve been like I was. You’ve had no idea how to make more sales on Amazon. Maybe you’ve searched Google or YouTube for answers…but still your sales aren’t improving. And it’s not like your competitors are going to tell you what to do. So, another month passes and you take another stack of cash to the shredder. By the end of this letter, I’ll reveal how to take your stacks of cash to the bank instead of to the shredder. If you choose to keep throwing money away after that, then I can’t help you. My name is Chris Leake. 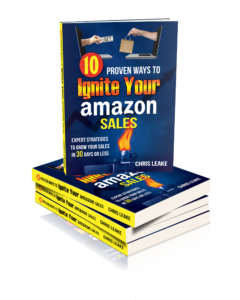 I’m the author of 10 Proven Ways to Ignite Your Amazon Sales, and I’m a Digital Marketer certified E-Commerce Marketing Specialist and Customer Acquisition Specialist. When I first started selling on Amazon in 2012, it drove me nuts trying to figure out how to get my products to rank higher and sell better on Amazon. Have you ever felt like successful Amazon sellers know something you don’t? Something that everyone is holding back from you? I sure felt that way. But I wanted answers. So I spent hundreds of hours studying, thousands of dollars on courses and training materials, and more days than I can count on trial and error. And then there were the forums. Oh, how I spent hours scouring online forums, asking questions, and reading comments. After all that, you know what I found out? I learned it’s true! The most successful Amazon sellers follow a set of proven steps that almost no one else uses. What most businesses don’t realize (and I didn’t either), is that increasing your sales on Amazon isn’t that complicated…once you know how. There is only one reason your product isn’t selling better. It’s because you’re not following the proven steps. As I began using the building blocks I was discovering, it was deeply satisfying to watch my products shoot to the top of search results. I would be embarrassed to admit how often I logged in to Seller Central to see my new sales coming in. When others heard about the success I was having on Amazon, they started asking for my help. That’s how I confirmed that the steps I’m using in my own business can work for any business. So who else wants to increase their Amazon sales in 30 days or less? As I started helping a few other businesses, the successes kept rolling in. We nearly tripled the sales of one of my early clients in the first 30 days of working with him. Three and a half years later, his sales are still strong. I helped another client take a brand new product from 0 to 500 sales a month in less than 8 months. His product became the number one search result in his niche and an Amazon’s Choice category leader. In between helping clients, I continued to successfully launch new products of my own and rank them well in search results. Are you ready to learn exactly how to increase your Amazon sales? I can help you get where you want to go. I have created a special service to diagnose your unhealthy sales and prescribe the cure. I call it the Amazon Power Profit Review. A personalized diagnostic survey of your Amazon account and of each of your product detail pages. A 54-point checkup, with a detailed written report scoring you on every key profit factor and highlighting areas of needed improvement. A personalized 5 Paths to Profit action-step checklist. This will reveal your lowest-hanging fruit – the 5 most important steps you should take right away in order to increase your profits. A 45-minute one-on-one phone consultation to go over the results of your performance review. In your Amazon Power Profit Review, I will hold nothing back. I created the diagnostic checklist I’ll use for your review based on the exact steps I’m using in my own business and in those of other clients. How about I save you hundreds of hours and thousands of dollars? I spent years of effort and piles of money learning the lessons I’ll put to work in your Amazon Power Profit Review. The action steps I’m going to give you could easily make you thousands of dollars per month for years to come. Clearly, I could charge $5,000 or more for this service. And many would fully expect me to charge at least $2,000. But I’m not going to charge you $2,000. In fact, I’m not even going to charge you $1,000. If you order today, I’ll give you your Amazon Power Profit Review for a one-time fee of $497. Beyond today, I cannot guarantee the price due to the increasing demands on my time. That’s just $497 to learn the keys that could make you thousands upon thousands of dollars! Along the way, I’ve realized that all the knowledge in the world isn’t worth a thing unless you turn that knowledge into action. I’ve shown you the way to transform your Amazon sales and rake in the profits you’ve dreamed of. The path ahead just takes one simple step. Click the Buy Now button and order your review. It only takes a minute. As soon as we receive your order we’ll contact you to let you know we got it. We’ll ask for a bit of information from you, and then we’ll have your review prepared and your consultation scheduled within 10 days. You can step forward toward Amazon success, or you can walk over to the shredder with another stack of cash. Click the Buy Now button right now and order your review. I love helping businesses make more money and eliminate frustration. It will be my pleasure to serve you. P.S. I told you I can guarantee that you could be making more money right now on Amazon. And I mean it. When you order your Amazon Power Profit Review today for $497, if I find I cannot 1) provide data that clearly demonstrates that you’re missing out on profits on Amazon, and 2) show you how to start capturing at least a portion of the lost profit, I will give you all your money back.